In celebration of Canada’s 150th anniversary, Maryhill Maple created a very special limited edition bottle of maple syrup! 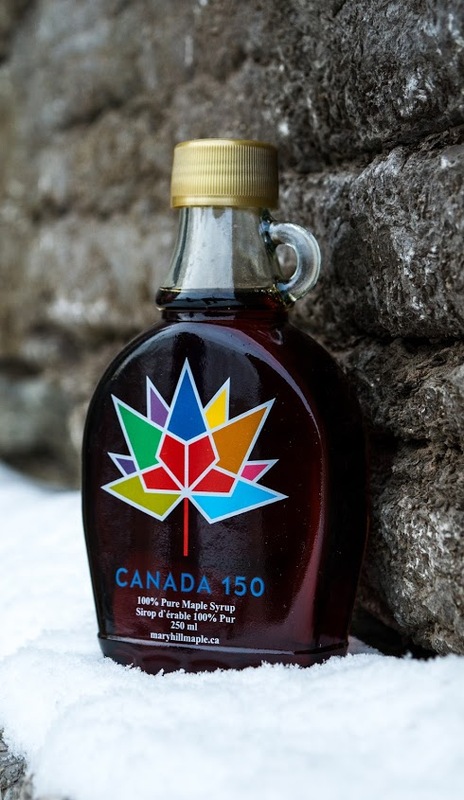 Maryhill Maple has been granted the licence to use Canada’s sesquicentennial, full colour, 150th Anniversary maple leaf logo, on our 250ml bottles! Production will only ran to the end of 2017 with only 3132 bottles fired. This is not just a sticker label; at temperatures up to 1000°F, the logo has been fired into the glass with ceramic paint, resulting in an image that is vibrant, Microwave safe, dishwasher safe, with an impressive result that with last for years to come. Three labels in one! The Canada sesquicentennial 150 logo contains 12 colours plus the white border. The ceramic paint screen printing can only do 5 colours in one pass requiring 3 passes to create! The complicated image is then applied to each bottle by hand and fired in small batches. In addition, Maryhill Maple has ventured with local maple syrup producers, to bottle this year’s harvest of our high quality, pure Ontario grade A Maple Syrup. ​Real Maple Syrup is one of the rare items all Canadians know and love. Most recognize Ontario’s Grade A as the best quality and tasting syrup. Lastly, we believe this bottle is a memorable keepsake for all Canadians alike!